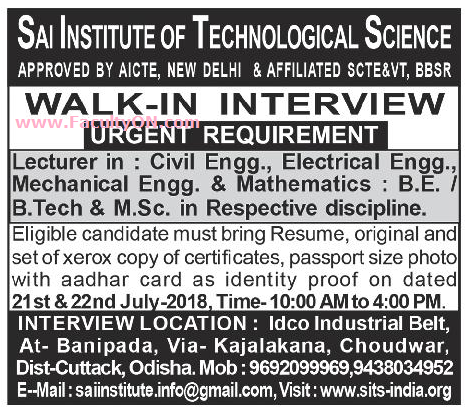 Sai Institute of Technological Science, Cuttack has advertised in the SAMAJA newspaper for the recruitment of Teaching Faculty- Lecturers jobs vacancies. Interested and eligible job aspirants are requested to walk-in on 21st and 22nd July 2018. Check out further more details below. About College: Sai Institute Of Technological Science was founded with the noble vision to raise professionals and leaders of high academic calibre and unblemished character, nurtured with a strong motivation and commitment to serve humanity. The Sai Institute Of Technological Science was started as a private Diploma engineering School on November 2009. How to Apply: Interested and eligible candidates are requested to attend the Walk-in interview along with CV, originals & one set of copies of certificates and recent passport size photo and aadhaar card as identity proof to the Walk-in address given below.